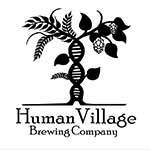 Home » Dining » Human Village Brewing Co.
Humankind’s origins lie within the Village. The Village allowed for the creation of civilization, the specialization of roles and trades, and a gathering place to share ideas. Beer is a beverage of gathering with origins as old as the Village itself. Beer was crafted from the simple raw elements that sustained us: water, grain, and the fire’s heat. Our brewery reflects the values of this archetypal Village. Our humanity is that we create and share. We connect. Raising a glass to these connections is part of the human experience, the world over and across time. Cheers!